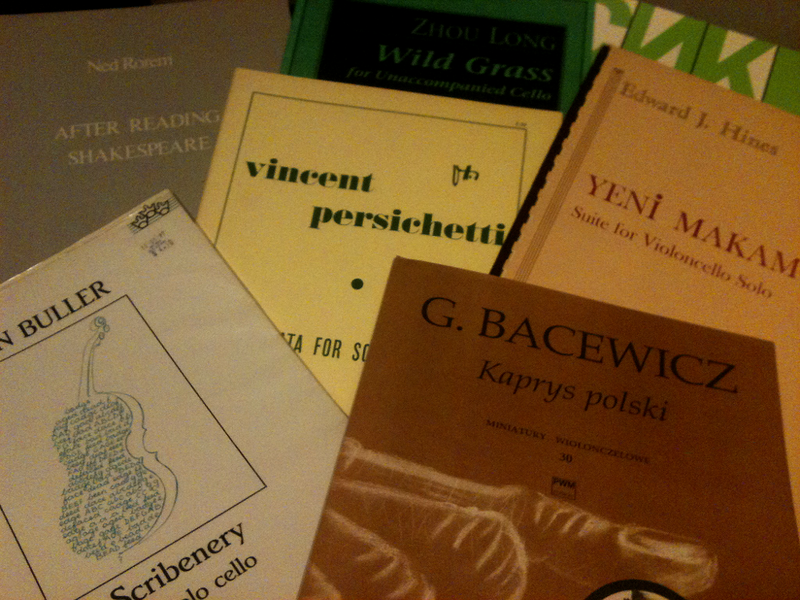 As I was looking for scores for my students who performed at the ISSMA Solo and Ensemble Contest this past Saturday, I came across a number of my collection of sheet music for new solo cello works. I’ve not looked through them until lately as I’ve started up my two lastest new music projects (The Mothership Ensemble and Camera Lucida). The photo above barely scratches the surface of what I’d collected in that last half of the 90s before transitioning into more Performance Art and Experimental Noise Music. I know that I said I was going to go directly into part 2, but I think this short detour through 1.5 is warranted as I’ve been slowly coming back into doing this repertoire again. During my senior year at the DePauw Music School, I actually performed my senior recital in the first semester. The repertoire was pretty traditional–though I did include a number of early 20th century works on it (Webern’s Three Short Pieces for Cello and Piano, Hindemith’s Sonata for Solo Cello, and the sublime movement from Messaien’s Quartet for the End of Time “Louange à l’Éternité de Jésus”) in addition to the Beethoven and Schubert works I performed. My plan was to do a “second senior recital” which would be a lecture/performance and I would focus on new music. That never happened as I was quickly getting burned out on the whole conservatory and traditional music scene. By then I was already exploring the more experimental side and often performing/premiering new pieces by student composers. Also, my cello professor, Eric Edberg, was starting to get his cello students into improvisation which is an essential skill for any well rounded musician doing new music. I would often just spend a couple of hours improvising alone or with friends and we occasionally recorded those sessions. I would later spend a summer house-sitting for him and record dozens of hours worth of improvisations with the looper such as this one in which I explored microtones (yeah, I was heavily into Harry Partch at the time). During this that early Chello Shed period, I performed a number of these solo cello works. 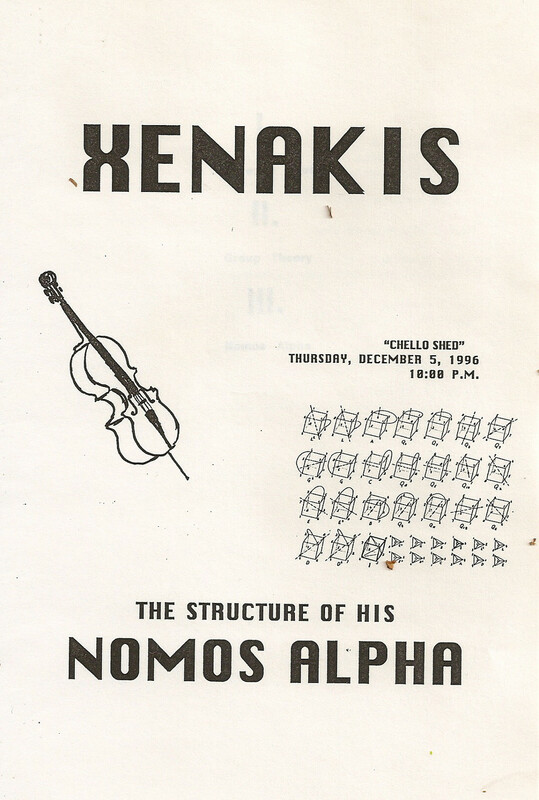 Sometimes this was within the context of presentations or lectures, such as Xenakis’ Nomos Alpha. “Xenakis: The Structure of His Nomos Alpha” Lecture/Performance based on the Thomas DeLio’s published analyses of the work. Other times, these would simply be “recitals” where I’d often also include many of my own experimental compositions. 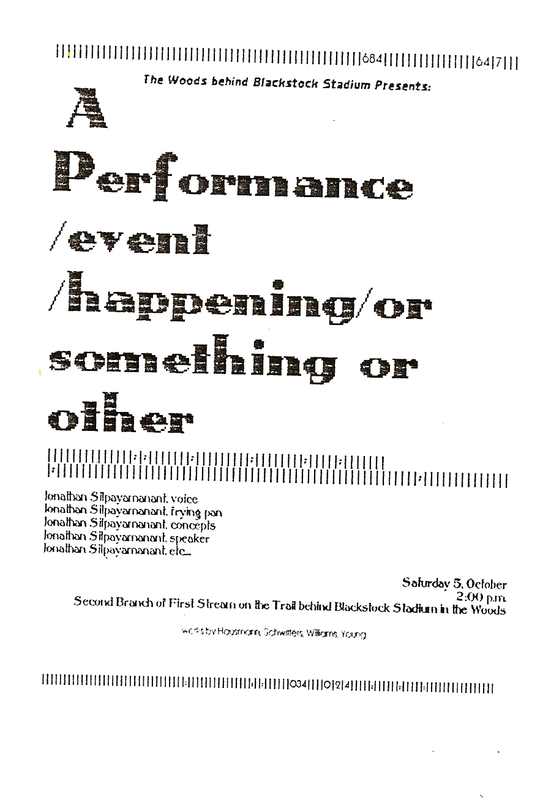 In that two year period of Chello Shed events I probably performed a couple dozen pieces for solo cello, cello and electronics, or experimental cello pieces–including a good half dozen of my own. Since I’ve come back to new music for solo cello in the past couple of years, I’d already spent nearly the past decade exploring a variety of other techniques and genres which incorporate the cello. I’ve recently become very interested in repertoire that focuses on the cello and voice (and there are a fair number of works like this) since I’ve spent nearly all my time back at the cello regularly singing while playing the cello. Repeat performances of “Wormhole:Caesura” (string trio and baritone) by Rachel Short (the other director of the Mothership Ensemble) had me singing the Baritone line while playing the cello due to vocalist issues after the premiere performance. 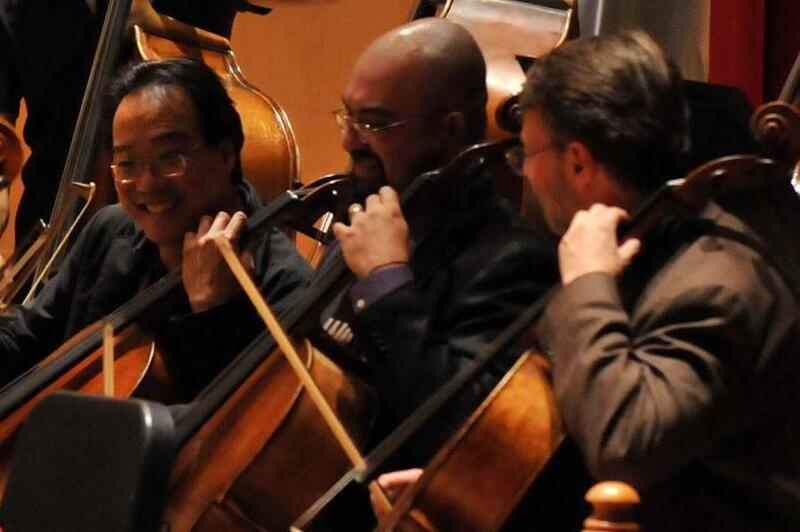 I’ve also recently performed Joan LaBarbara’s “a trail of indeterminate light” which requires the cellist to sing while performing during one section. I’ve been surprised (and pleased) at how quickly some of these skills have come back to me–and I remember how quickly it was to pick up and learn new repertoire–especially as you get immersed in it. And with my two current (and yet to be announced upcoming) new music projects I imagine I’ll be all over the map with new repertoire and tricks in the near future. It’s good to be back in this scene on my own terms and without the constraints of academia bogging me down. Next post in this series will definitely be about the Indianapolis activities and the INDYtron festival and resource website and how that is the intermediary link to NuMuLu–I promise!